If you’re looking for a beautiful new family home or investment property, you’ll have plenty of great options in Peoria. With homes and townhouses of every size, top-notch amenities, great schools, renowned annual events and lots of parkland to explore, Peoria has something for everyone. Come see what makes Peoria one of Arizona’s best communities for young families and one of Money Magazine’s Top 100 Places to Live. Peoria has a variety of housing options available on the market, ranging from budget-friendly two-bedroom starter homes up to multimillion-dollar estates. You’ll find several row houses and manufactured homes in the area, which serve as affordable housing for young couples and retirees. There are also a number of one- and two-bedroom townhouses available for $90,000 to $100,000. For those who are ready to commit to a full-sized home, 2-4 bedroom bungalows start around $120,000. Looking for something more upscale? There are several 5,000 square foot family homes available for $200,000 to $250,000 that would serve as great move-up properties. And for discerning buyers who want the very best, you’ll find premium estates on vast acreages featuring saunas, stables, bonus rooms, stone flooring, and built-in barbecues. These upscale properties average around $900,000 to $2 million and offer the very best in luxury living. Peoria is conveniently situated close to several great schools that children love. Parkridge Elementary School is a public K-8 school situated in a quiet suburb in south-central Peoria. The school offers a variety of great programs for students, including cross country, volleyball, choir, and drama – and the school’s commitment to building a purposeful community has garnered it an “A” score from the district. Older students can attend a variety of high schools located all across Peoria. Peoria High School has multiple academic tracks for students to follow. The Honor track allows students to take on a more challenging workload, and in return, the student benefits from a higher GPA. The school’s AP program allows students to take college-level classes for college credit. The school is home to several great extracurricular programs, like Student Council, Band, a dance theatre club, and several different sports. Peoria offers close access to all sorts of great shops and parks. At the community’s northernmost tip you’ll find Lake Pleasant Regional Park. This scenic park offers lots of recreational opportunities, including fishing, boating, camping, swimming, and hiking. The park is also home to the Scorpion Bay Marina and Yacht Club, where boaters and yachters can store their watercraft or rent a covered or uncovered slip boat. After a long day of boating, a hearty dinner at Dillon’s Restaurant will hit the spot. This down-home American restaurant serves all sorts of smoked, barbecued, and spicy fare. With offerings like the barbecue beef brisket platter, fish tacos, and the Portobello mushroom sandwich, you might be tempted to moor the boat early and spend the day watching the boats sail up and down the lake. You’ll also find lots of great shops in the area. The Park West Shopping Mall on Northern Ave is home to lots of brand-name retailers like Bath & Body Works, Chico’s, LensCrafters, and more. It’s also home to Toby Keith’s I Love This Bar & Grill, a southern-style restaurant owned by the Big Dog Daddy himself. The nearby Arrowhead Towne Center is home to lots of great retailers like Cold Stone Creamery, Pier 1 Imports, JCPenney and more. Peoria hosts a variety of great annual events, each celebrating a different culture. The Peoria Greekfest is hosted at St. Haralambos Greek Orthodox Church and has been running every February since 1988. There’s also a popular country music festival, called P83, that occurs every year on 83rd Avenue. The P83 Festival began in 2009 and generally draws close to 10,000 visitors per year. The local Lake Pleasant Regional Park is home to the annual Lake Pleasant Paddle Fest, which features fishing derbies, free paddle craft demos, wooden boat displays, a scavenger hunt, and a paddle craft race. No matter what your interests, you’ll find a great family-friendly event to enjoy in Peoria. 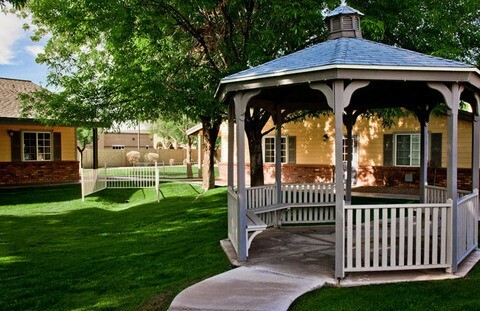 Peoria is a fantastic neighborhood with lots of amenities and activities for families to enjoy. Are you ready to find your new Peoria home? We can help. With homes available starting at just $120,000, there’s never been a better time to buy. Call us today to view Peoria real estate and find your next family home.